I'm not going to lie. Insurgency is one of the most enjoyable shooters I've played in a long time. As I stated in my review, it's not perfect, but damn is it fun anyway. Well, developer New World Interactive have taken notice of all the praise, but also of the criticism. A new patch just hit, and at a staggeringly low 9mb, you'll be surprised at all the changes and improvements. 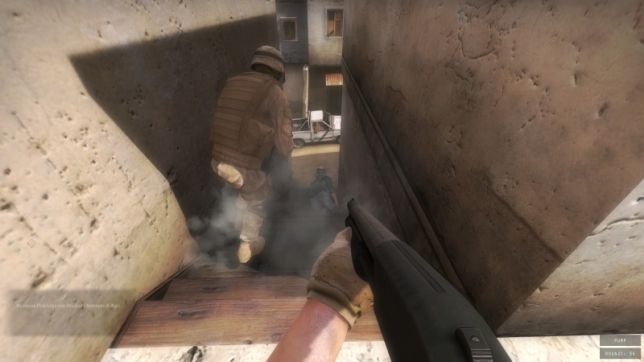 Key changes include a global ban system that will hopefully deal with hackers and exploiters faster than Valve's Anti Cheat system, a Purity system that allows servers to decide whether or not to allow edited files such as custom skins, sound-mods and so forth, the ability to adjust one's own microphone volume in the options menu, the ability to see which attachments other players are using, FOV adjustable up to 110 as well as several smaller additions, map, mode and weapon tweaks and so on. Head over to their forums for the full changelog. In addition to the patch, NWI have announced on Steam that they have been picked up by ESL, the Electronic Sports League, and will apparently be running a European tournament sometime in the near future. "As many have remarked, we have great potential as a competitive game. Well, ESL has taken notice, thanks to our fans requesting they add the game to its community." Good stuff, it's always nice to see that competitive gaming on the PC is still alive and kicking - and more importantly, that developers actually support it for their games. Cough Battlefield 4 cough. Jenssen taking my review credit! No, but really, it's cool to see these guys getting some appreciation. Insurgency is a good time.